Savannah spas provide the ultimate in relaxation and rejuvenation! If you’re ready to experience heaven on earth, then you’re in for the ultimate treat. Discover an oasis of health and tranquility beyond the excitement of the city. 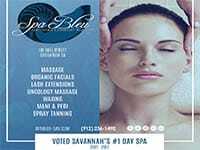 Savannah’s luxurious day spas cater to each individual with a bevy of pampering services including massages, body treatments, facials, body scrubs, manicures, pedicures and much more.